President of the International Institute of Space Law (IISL) is a national of Sri Lanka, holds advanced degrees in Law and International Relations from the Universities of Ceylon, London and McGill, and is an Attorney-at-Law. He was formerly the Deputy Director-General of the United Nations Office at Vienna and Director of the Office for Outer Space Affairs. 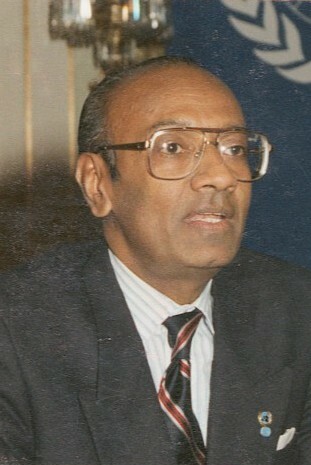 Dr. Jasentuliyana is the author of the four-volume "Manual of Space Law", Oceana (1979), "International Space Law and the United Nations", Kluwer Law (1999), "International Space Programmes and Policies", North-Holland (1984); and editor of "Space Law: Development and Scope", Praeger (1991) and "Perspectives on International Law", Kluwer (1995). He has been a visiting lecturer at Princeton, Stanford, Columbia and McGill. He is a Trustee of the International Academy of Astronautics (IAA), member of the Board of Directors of International Space University (ISU), and serves as a member of the Editorial Advisory Board of the "Journal of Space Policy", published in the United Kingdom, and the "Journal of Space Law", published in the United States. He was the Recipient of the 1982 Testimonial Award of International Astronautical Federation (IAF) awarded annually in the recognition of important contributions to space law and policy and the 1989 Leadership Award of the International Academy of Astronautics (IAA). He was selected by the United States National Space Society to its unique world-wide list of "100 space people who have had the greatest impact on our lives".